The Cobblers head back out on the road on Saturday aiming to right the wrongs of the past two away games in Sky Bet League One. Town have endured a couple of nightmares in their two most recent trips, with the 5-0 thrashing at Bristol Rovers being followed up by the 5-3 reverse at Milton Keynes Dons. 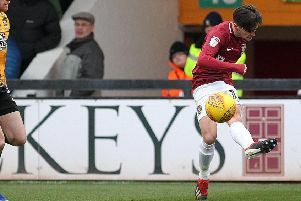 But with confidence boosted by the team keeping a much-needed clean sheet in last weekend’s comprehensive 3-0 win over Coventry City at Sixfields, Justin Edinburgh’s men travel to Walsall in good heart. Central defender Zander Diamond has had a close-up view of the Cobblers’ defensive woes on the road, but he insists those problems are now behind the team. “You have to be confident you can solve everything if there are problems,” said the Scotsman. “We know we weren’t up to our usual standards in those games, but hopefully that is in the past now. “We have a great game to look forward to at Walsall, training will be high intensity, and it is full speed ahead to that. The Cobblers have been seemingly punished for every error in the past two away games, and Diamond says that is something the players have to accept. “In football, sometimes you get away with things, sometimes you don’t, and at that stage it seemed like the small deflections were dropping to the opposition, or they were getting the rub of the green,” he said. “We had it last season, where it felt as though everything fell for us and we were capitalising on it, so it works both ways. “But you make your own luck and I have been in football long enough to understand that. The Cobblers were 2-0 winners over Walsall at Sixfields earlier in the season, but Diamond was impressed with the Saddlers. “I think we saw they were a good side, and although we won it was a hard-fought game,” he said. The Cobblers could be boosted by the return of Gaby Zakuani after international duty this weekend, and Diamond says it is crucial he and the injured players are back into fold as soon as possible. “We have Zakuani who has been out, Moloney’s been out, Revell’s out, Hoskins is out, and they would be a miss for any team,” said Diamond. “We are all pushing in one direction and hopefully we can get the squad back together, and we will have our strength in depth. Another key to the Cobblers securing their league one safety will be the role of manager Edinburgh, and Diamond has been impressed by the new man, who took over from Rob Page. “It has been good since he came in,” said Diamond, when asked about the Town boss. “A new manager obviously comes in with new ideas, and a different philosophy to what the previous manager did, and it is up to us as players to buy into that as quickly as possible. “In football you don’t get time, and hopefully the majority of players, if not all of them, have bought into it.